The everyday objects of communities are often taken for granted and are not recognized as being important or symbolic of their histories or identities. An ethnographer approaching a community from the etic perspective is more likely to notice the significances communities attribute to objects, such as where the objects came from, what they are used for, who makes them, and why they were made the way they are. These objects when read as texts, and after textually analyzed, become clues to the traditions, rituals, values, rules, and behavior of a cultural group when treated as artifacts. In this essay, I will apply the ethnographer’s fieldwork gaze on four everyday artifacts from the Mexington Library. With recourse to my fieldnotes, I will describe the uses and external details of several artifacts found in the Mexington Library, as well as the spatial layout of the library itself from a brief exterior and interior mapping. Of course, since I conducted fieldwork at a library, I had much to choose from in terms of linguistic artifacts, an innumerable amount of literacy technology and tools, and pieces of writing produced and read. I limited this study of artifacts to three, two computers and an art project incorporating writing and visual presentation. I focused on these artifacts because they didn’t relate solely the homework aspect of the tutoring center, but more on the less noticeable traces of professionalism that were implied by the space and technology available at the library. They also suggested notions of access and division between students and their parents. The four remaining photographs embedded within this study represented the library’s spatial nature. I will argue that the space of the library established community socializing by arrangement of furniture, and it dictated networking and circulation between families and children, but less so with tutors/mentors. This had significance because such restrictions in place created the spatial ethos, or the legitimacy of the space as one for learning. This sense of belief in the legitimate ethos of place was what created a pattern of separation between tutors who resembled school authorities in the context of this school-like space and parents who felt alienated from educational institutions. Nevertheless, the space of the Mexington Library invited networking among families in the area while also locating support in a local government institution. The artifacts here all came from my continued fieldwork at the Mexington Library. Analyzing these objects as texts in this study included research into the Mexington Library’s history of these artifacts. This research came from interviews with library staff and also researched in local news archives. I photographed the images contained in this essay while conducting fieldwork observations at the Mexington Library. I took the photos with a cell phone—a Samsung Galaxy S—and also with an iPad. I edited out identifying information through cropping. I transferred the images via e-mail to a laptop, and inserted them into the text of a desktop publishing program before publishing the essay on my blog. I selected artifacts I thought best represented what one would perceive at the library from a tutor’s perspective. The artifacts and spaces here represented offer only a glimpse into the social dynamics of the Mexington Library and its brief eight-year history. Computers played an important role at the Mexington Library. They were used for homework, but they also were used for entertainment, research, and staying in contact with people in different parts of the nation and world. Computers were plainly visible at the Mexington Library. In the main entrance, one encountered two computers directly to the right of the door, the two main check-out stations for books. Across the small checker-tiled walkway was another computer, this one used by another member of the staff. This staff member often looked up books for library clients. On the far wall were seven computers arranged on “small” desks, or specific for student-only use. Students signed up with the staff member at the computer to take turns using the machines. Students were permitted to use a computer for one hour daily. If there were extra spaces available, students could sign up again after their first hour was up. This tended to happen only during weekday mornings and later in the evening before the library closed for the day. Getting in line for these computers was often the first thing students did when they entered the library during the hours of highest traffic—typically from 3:30-8:00 PM Mondays through Thursdays. In the newer western wing of the library, adults used computers. These computers, however, seemed mostly to be composed of older students, between middle- and high-school ages. There were some parents who used these computers, as well as other individuals without children using the library. There were 28 computers for use in this room, and sometimes groups of three individuals or more at each computer. There were only a few staff computers, and these were all off-limits to patrons. For volunteers, there were no computers for use, though they could sign-up to use one of the public computers if they chose. The one computer that volunteers had access to, and which the public didn’t, was the sign-in station laptop located in the back storage room of the library, a room restricted for library personnel. I discuss more about the different restricted and public spaces at the Mexington Library in the next section of this essay, but for the moment I would like to focus on the technology available to different members of the Mexington Library community and how access to technology influenced the separation between tutees, their parents, and tutors. 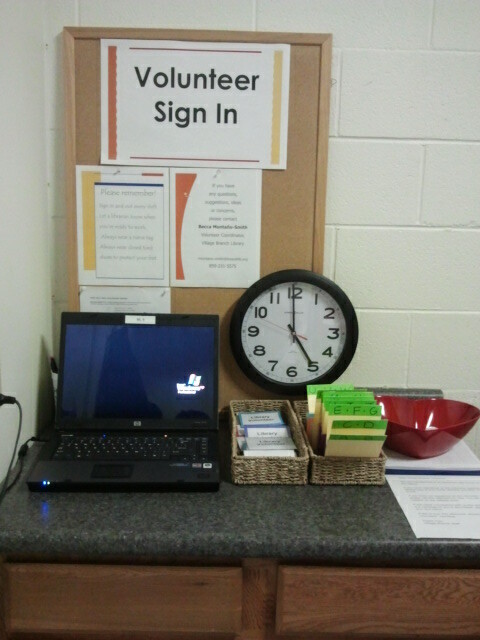 Figure 1: Volunteer check-in station. Located in the back storage room restricted to staff only. The station was not accessible by students or parents—it was restricted storage space limited to staff. In the same room, the library stored supplemental materials and cleaning supplies. There was also a separate bathroom for staff. Figure 1 is a photograph of the tutor sign-in station. I took the photo just as I signed in for my two-hour shift on a Monday afternoon. To the right of the laptop were nametags for different volunteers, some arranged by tutors’ names, “Miss Jane,” “Mr. Steve,” “Mrs. Anna,” and others with the more generic “Library Volunteer” for new tutors. The laptop was certainly dated, and this was why it was relegated to this position in the library. Previously it had been used for homework help, but with the assistance of grant funding, the library purchased newer technology to use for homework, digital tablets. Many of the laptop’s keys stuck on the keypad. The computer was only used for this function as it had largely served its purpose before the introduction of newer technology for student use. To the right of the laptop in Figure 1 was a clipboard sign-in sheet. The library staff left this next to the laptop in case something happened to it, or “if it finally dies,” according to Rachel, the library’s Assistant Manager. The clipboard sign-in sheet was the previous method the library logged its tutor hours. Though the library continued to employ laptops for student use, the majority of resources had been directed to tablet computers, in particular, the iPad. The iPads were used when necessary, but usually were not employed when not necessary. In addition, the use of newer technology by students and staff at the Mexington Library seemed restricted to students, tutors, and staff. There were no classes for parents in using the iPads or any of the technology they could use to help children with homework. There were also no workshops for tutors to use the technology either, and some tutors were not familiar with iPads or Apple platforms. The Mexington tutees didn’t always use tablets for their homework, but the computers were always available for student use when approved by staff. When not in use, the iPads were stored in a locked cabinet in the back of the tutoring room. The tablet computers were used less for schoolwork and employed mostly to organize the day-to-day operations of the tutoring center. Figure 2 below gives a closer view of an application that tracked students signed-in for homework help and also which students had received help already. The list was part of a network between sign-in stations located outside the tutoring room and also connected to the assisting library staff member located near the general sitting area in the library. In addition, the library manager and assistant manager could log in at any time to review the data, which was later archived for future tabulations. 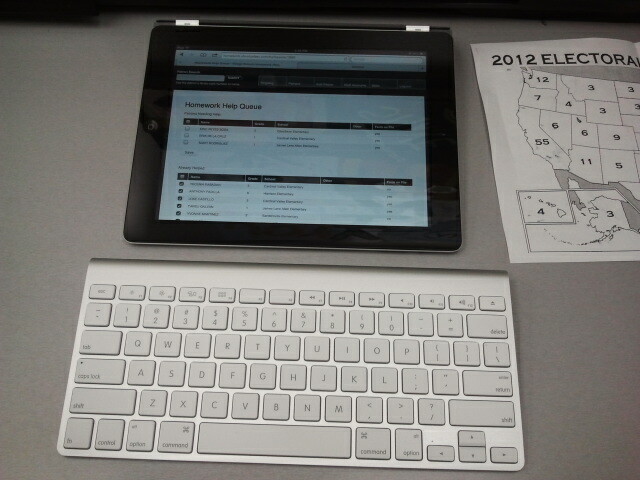 Figure 2: Waiting list app and iPad. The iPads were new for the after-school program, and an educational grant helped to fund the endeavor to employ them for tutoring assistance. The use of iPads, however, was not as useful as they could be in terms of implementing them in student development with researching information or even overlooked “basic” skills such as typing. It was notable that the tracking of tutors happened on antiquated equipment, but that the tracking of students occurred with the newest technology available at the library. The reason for this was the importance placed on the numbers of students passing through the program. The accumulation of all data, of course, was used for generate statistics, but also for grant purposes—to compete for grants, but also as requirements for grants awarded. Yvette and I are working on an iPad to look up desert animals. Ms. E, one of the lead tutors, asked me to take over where she left off so she could get to some planning. I gladly assented. Yvette already had copied and pasted images from Google onto a Word document on the iPad. She had an image of a snake, an armadillo, a lizard, and a roadrunner. According to Ms. E, we should write a few sentences about each picture, especially focusing on the things each animal ate. Afterward, we would print up our work, and she would apply her creation to posterboard for a display in her class tomorrow. We conducted some searches about each animal through Google, and we each took turns looking for items she could use. I did my best to guide her as she did the work on the iPad. I noticed she typed with two fingers, but she made very few mistakes. She didn’t appear to use tablets much. This was interesting as the previous night I had been discussing aspects of literacy, educational attainment, and access at a different community event. As I worked with Yvette here, I saw how she used her alphabetical literacy with some of the practical tools she needed to master in order to complete this form of academic discourse/visual rhetoric she would offer for her classmates. I showed Yvette how to resize images, and she had a fun time with this. The sentences we typed came from notes I wrote by hand as we read the different websites we discovered through using search terms such as “What snakes eat.” Wikipedia helped us greatly. I asked Yvette to generate some sentences, and I took notes as she spoke. She then typed the sentences we generated together on the word processing program. We saved her work on a thumbdrive, and one of the library staff members printed Yvette’s work. The staff member also provided us with some heavy construction paper in order to apply the images. After Yvette cut out the images and applied them, I encouraged her to draw a desert scene. I used some of my experiences to help her draw a saguaro. She also outlined some purple mountains, and she added an orange sunset. Yvette demonstrated a divide that between access to types of technology not available for her at home, but possible at the Mexington Library. At her home, she did not have a computer. Her computer access happened at school and at the library. What was at issue for me was less the skills she developed as a student—though without doubt in the future she would acquire tremendous dexterity at working with technology to compose reports and other multimodal projects such as that in the fieldnote. Rather that read the fieldnote above in this manner—in terms of collaboration between iPad, tutor, and tutee—it’s equally important to account for the disconnection between Yvette’s parents in the activity: their restriction from observing the project’s construction and planning, or their daughter’s use of the technology. This raised a host of questions for me which I hoped to consider with additional time and fieldwork at the Mexington Library, including: How would dynamics in families change if parents participated and observed these skills? What if they aided with the technological aspect? Would parents learn skills from children, or vice versa? Or would the technology further exclude them from participating in their children’s learning? What kinds of divides happening digitally between language-divided families? Figure 3: The front parking lot of the library, located in a shopping center. Next door to the west is a small hair salon, and to the east a discount grocery store. In recent years, the library has been expanded to most of the western end of the shopping center, surrounding the hair salon on both sides. Of the six community branches of the public library system in Lexington, the 10,000 square-foot Mexington branch was the newest. It was opened initially in 2004, and later expanded in 2008. As Figure 3 above illustrates, the library found its home in a local shopping center on the west side of the city. 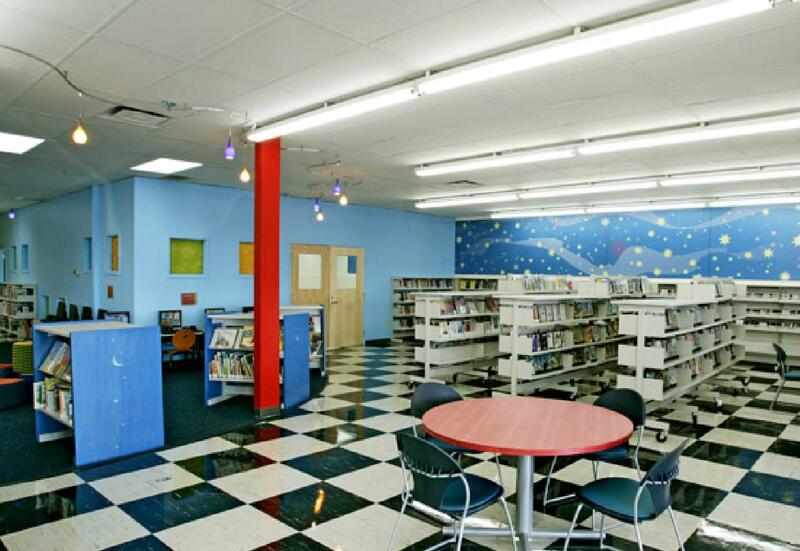 The space in the shopping center was a cooperative venture among the public library, a large corporate bank, and the remnants of the formerly independent Hispanic library, which was completely run by volunteers. The Hispanic library eventually moved into the Mexington Library, as did the Hispanic library’s advisory council, which continued to offer and direct community programs and services. Most important, all the acquired Spanish language materials of the Hispanic library were relocated. In addition, the main investor—the bank—contributed close to $20,000 over the first three years to purchase more. Over eight years later, the Mexington Library had extended its collection of Spanish materials, and had also expanded to two-thirds of the west wing of the shopping center. The space had increasingly lent legitimacy to the emerging immigrant community living in the ethnic enclave. The professionalism of the institution was legitimated by its space, and the space was a broker between the Mexington community with the larger city-school complex. In terms of seeing the Mexington Library’s space, it was a new location for me, and I was experiencing that as an etic observer. I’d been getting to know everyone at the branch, and as I became more familiar, I became more acquainted with the space, including access to restricted areas. The space was alive with activity and hardly a quiet place to do silent reading during certain hours and days of the week. Figures 4 and 5 illustrate the interior of the library during closed hours, without visitors. Figure 4: An interior view of the Mexington Library before students arrived for after-school homework tutoring. Along the rear wall were the seven computer stations reserved for students. The back room was reserved for teens. It had one computer available for use. The shelves in the image held the library’s collection of Spanish-language music and films. Figure 5: Photograph of the interior of the main room of the Mexington Library. This larger room in the library offered a closer view of the all-purpose student area. Student computers were along the wall. Groups of parents, children, and parents and children sat at the chairs and tables in this section. Tutoring sessions were never held at these tables. The above images were of the main room just beyond the entrance, or just passing through the doors of Figure 3. The well-lit main room contained books, music, films, and computers for use. To the rear of the image was the teen room, reserved for teens during weekday afternoons. The room also hosted different community events, such as storytime and also events like workshops. Just outside the image were the two tutoring rooms separated from the activity of the main room. A staff table was eventually moved next to the red pole pictured at center, where an employee addressed general questions or concerns. The space was modern, clean, and orderly. For the Mexington community, it was an honored space where they understood that their presence in the city mattered to its officials, enough to warrant a library branch. Indeed, the Mexington Library was a legitimate institution intended to reach the community and address it needs. The library accomplished both these objectives, but it also helped to define the community, and in a sense legitimate it as well, through the community’s avid use. The community made its own stamp on the institution, both in its shape, but also in its character. One wouldn’t necessarily see this in the space, certainly not when it first opened, aside from the languages of materials. Eight years after opening, however, the library community and its patrons worked to create a personalized image representing local pride in place. Figure 6 below was a mural created by library staff, patrons, and local artists. Figure 6: Mural on west wall of Mexington Public Library. The mural was a project funded with external grants and collaborated between a professional artist and after-school program students. Some parents watched their children’s involvement, but few actually participated in the project directly. The mural was painted by students at the program, and led by a professional muralist commissioned to complete the project. 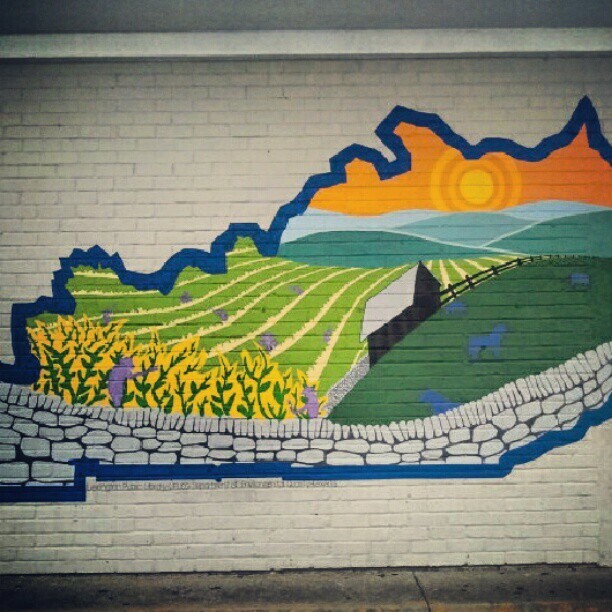 The outline of the state of Kentucky reflected the local landscape. There were subtle references to migration or the immigrants whose work went into producing such a landscape with the purple figures down the line of plants in the field. Workers were not absent from the portrayal. There were references to the horsing and farming industries with the images of the farm and fenced-in animals. Rachel, the Mexington Public Library’s Assistant Manager, organized the creation of a mural on one of the library’s outside walls. The Mural was funded by grants from two local non-profit organizations, one based in the arts and the other in urban renewal. Over $5,000 in grants permitted the library to hire a professional artist to work with students to paint the mural on the building. The participating students were frequent branch patrons as well as participants in the after-school program. Students gave frequent input to ensure the mural would encompass the theme of Kentucky’s rich agricultural history and the people who worked it. The intention of the mural was to bring students together with artists to personalize the library. Though students had limited input, the overall reaction by the community was a pleasant mixture of pride and awareness of the changing nature and growth of the library. The liveliness of activity in the interior began to externalize beyond the building’s interior bounds and moved into local urban renewal. In this essay, I touched upon some of the technological artifacts representing the Mexington Library. I argued these objects had the potential to unite the community with tutors acting as mentors rather than simply as homework agents divided from the interests of local families patronizing the library. 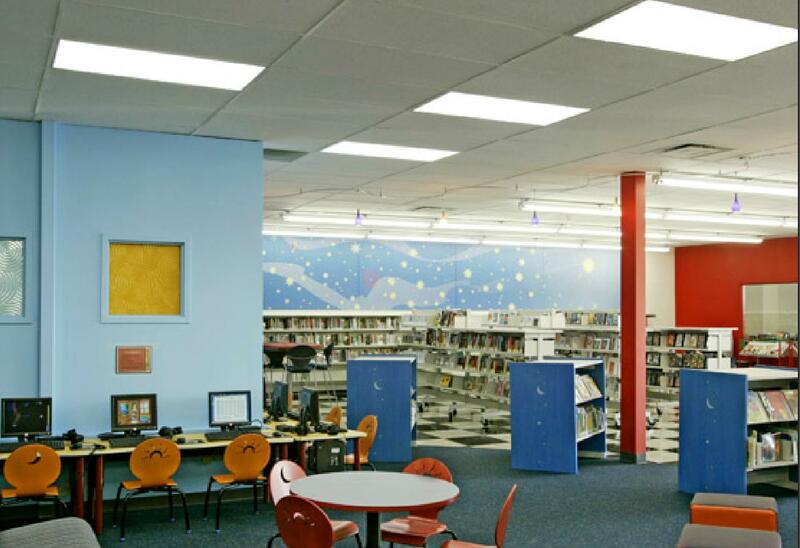 Ultimately, the Mexington Library was family-oriented, and the space had energy of the social not witnessed at the other branches of the city library system. At the same time, there was not much social interaction between tutors and parents. I argued that the space of the Mexington Library’s professional “school-like” feel contributed to the disconnection between library tutors and tutee parents. The linguistic divide between monolingual Spanish and English also partly attributed to the disconnection (though all library staff were fully bilingual). Most homework exchanges occurred in English. The students were taken to the tutoring room to work on their school work, meanwhile out in the main room of the library, Spanish freely circulated among adults and children, as did English. I think it was significant that there are no projects that included tutors, students, and parents. Once those exist, a further element to connection families and the Mexington community-organizing would be reaffirmed, and decrease the distance immigrant parents had for educational institutions which marginalized their children and them. Figure 7 below was one example of a project that could have benefited involving students, parents, and tutors. Figure 7 was an art project made by sixth grader Fatima during an hour-long art class led by library staff member Miss Jenny during after-school hours. The decorations were intended to serve as decorations for the tutoring room, but also as objects that reflected the changing season and Halloween. Figure 7: Tutee Halloween art project. 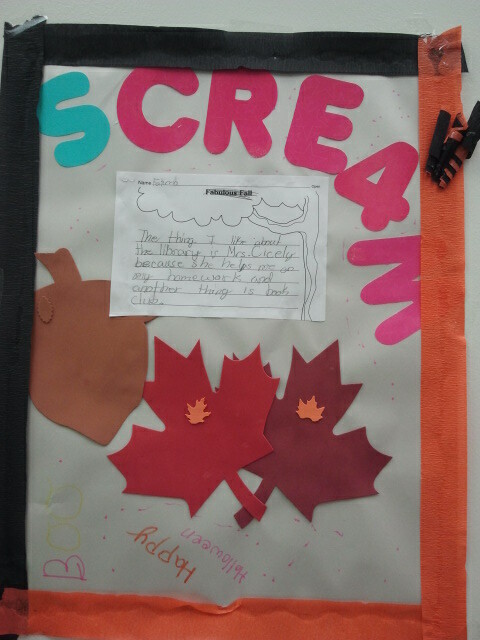 The project constructed by sixth-grader Fatima combined colors and images of fall with the popular reference of a horror film, Scream. This was contrasted with the written text at the center which was a tribute to one of the library staff members. The piece of artwork was displayed in the tutoring room. Such a project involving parents could be led by a single tutor with involved groups working with parents and children to complete the project. In addition, the aspect of combining craft with literacy offered a potential avenue to expose parents and children to reading and writing together, and potentially could lead to bilingual texts negotiated between tutors, parents, and students. Should a language difference arise between tutors and parents, children would serve as language brokers to translate. Alvarez, Steven. “Halloween Art Project.” Photograph. 23 Oct. 2012. —. “iPad List.” Photograph. 23 Oct. 2012. —. “Kentucky.” Photograph. 25 Jul. 2012. —. “Mexington Library Interior 1.” Photograph. 9 Nov. 2012. —. “Mexington Library Interior 2.” Photograph. 9 Nov. 2012. —. “Mexington Library Exterior.” Photograph. 9 Nov. 2012. —. “Volunteer Check-In.” Photograph. 23 Oct. 2012.